My review of the Reaper werewolves is one of the most read articles on Dawn of the Lead, which would suggest that there is an interest in werewolf miniatures. Another thing leading me down that track is the fact that I have a bunch. It’s time to put three of those under the looking glass and see what some of West Wind Productions’ lycanthropes are all about. Two of them are from West Wind’s Secrets of the Third Reich WWW2 (Weird World War 2) line. The line includes all sorts of fun things, with nazi zombies, vampires and the like adding to the chaos of war. 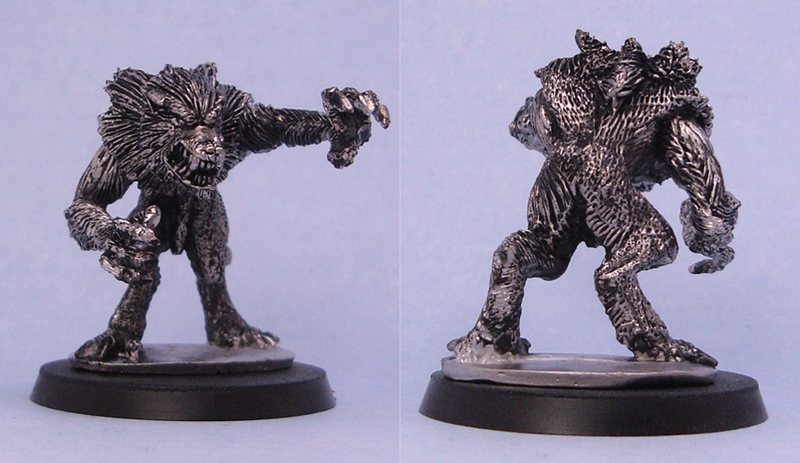 The line has several werewolves, and I bought a few for use in my Underworld miniature project. The third one comes from West Wind’s Gothic Horror range. All sculpts were very nice, and almost completely devoid of flash or mould lining. Big thumbs up to West Wind for this, since cleaning up bad casts is one of the aspects of this hobby that I hate. Jager Werewolf “Wolfgang” looks vicious. His head is tilted up and his teeth are bared. His posture suggests that he’s either going through a painful transformation or simply howling at the sky in fury. His pants are torn and his whole upper body is bare. I really like this model except for one thing – and this holds true for all the WW werewolves reviewed here. The model has lost one finger and two toes in the transformation process. While I’ve no qualms about the shapeshifting altering the number of digits, the three-toed feet look birdlike. Combined with an almost scaly texture, Wolfie and his buddies look like they’re walking around on chicken feet. Other than this, he’s a wonderful wolfman. Wolfgang comes with a round 25mm slottabase, and is sculpted by Andy Cooper. Jager Werewolf “Mondheulen” translates smoothly as Moonhowler. Whereas Wolfgang looks very much like a wolf, Mondheulen looks like a werewolf in mid-transformation. His face/snout is almost rat- or bat-like, a little bit like this fellow or his friend. His proportions are weirdish, with an improbably slender waist and long limbs. These don’t really bother me at all, but simply add to his menacing presence instead. Mondheulen looks very bestial and bloodthirsty, and his pose suggests he’s charging after some unfortunate victim. Like Wolfgang, Mondheulen has torn pants and chicken feet. Doesn’t mean I don’t love him, bless his little heart. Sculpting and basing as above. 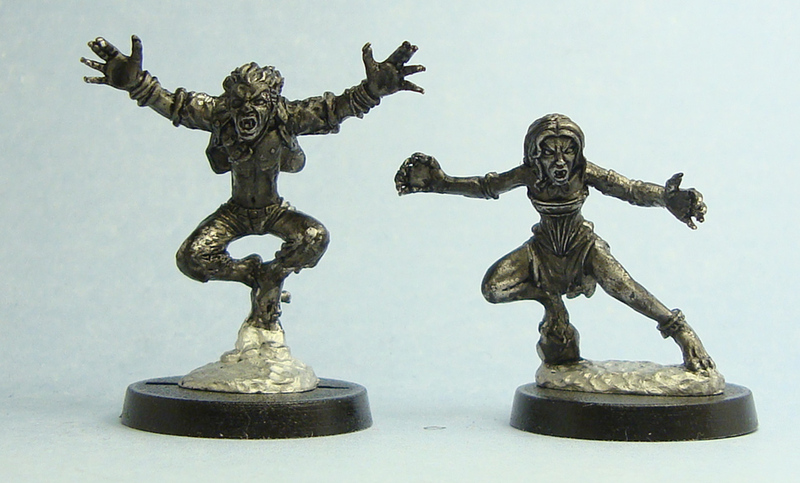 As the comparison pic below shows, the two werewolves are slightly larger than your average 28mm humans, making them just a bit more intimidating. All the models are available through the West Wind Productions online store. The Loup Garou retails at £5.00 and the Jager werewolves at £4.00 each. This isn’t that bad a price for quality models, so I had no qualms about paying, even if £13.00 for three models sounds a bit steep. Overall verdict: The West Wind werewolves are well worth buying. While they’re not quite as good as Reaper’s offerings, and if the chicken feet don’t put you off, you have some nice wolfmen in dynamic poses, and that’s always a good thing, isn’t it? Also, the Loup Garou is large enough to become a centrepiece model, if you put some time and effort in his painting and basing. All in all, these are a fine offering and well worth adding to your collection. My Underworld project is giving me ample opportunity to review all the lovely new models I’ve bought, and next up is a pack of heavily armed gunmen, namely Foundry’s Street Violence pack Hired Hitmen. As some of you may know, I’m using these minis as modern vampires, giving them the trademark black clothing and very pale skin. Like all of Foundry’s Street Violence packs, there are five models – in this case one female and four males. Sculpting is nice overall, with good and characterful facial detailing, flowing trench coats and solid posing. There is just one problem. I don’t usually complain a lot about my miniatures. Like most sensible people, I buy models that I like so there’s usually not that much to fault. That’s the case here, too, except for the atrocious mould lines on these miniatures. While I’m not averse to spending a bit of time to file and screape off mould lines and such, on these models it was a chore. I must’ve spent between 10-20 minutes on each of them with a selection of knives and files to get them to a paintable state and even then I had to (read: ran out of patience) leave some lines on in hard to reach places and on hair in places. The moulds have apparently been very misaligned, and if these hadn’t come from a trusted seller in an official Foundry blister pack, I’d seriously be suspecting a recaster. Then again this isn’t by far the first time I’ve received faulty castings from Foundry, as miniatures almost regularly arrive with missing thumbs or gun barrels, or with my favourite: a mould line with thick flash running right across a model’s face. It’s a shame that such wonderful models are let down by sloppy casting. With that off my chest, it’s on with the miniatures! Model #1 – Gabriel wears a suit under a long trenchcoat. His pose suggests that he’s either keeping watch or moving towards a corner, holding what seems to be a G36assault rifle. The model is ok, but it’s exactly that. Ok, nothing fancy nor too characterful. Model #2 – Ivor Trobsky carries a light machine gun, and wears a fur-lined trenchcoat over his suit, meaning that he could probably be painted as the most heavily armed pimp ever. The model is pretty static, however, and the copy I received has an awful mold misalignment screwing his head up somewhat. Model #3 – Valerian is cool. The combination of shades, four long braids of hair and a massive arsenal (an AK47, an MP5K and a grenade launcher. Yes, a grenade launcher.) somehow make her seem, I don’t know..unstable? She certainly looks like she could level a city block. She wears a sweater like Leon’s under a business suit. Model #4- Leon looks somewhat menacing (or like an evil wargamer) with his bald head, moustache and beard combination. He’s leaning slightly forward and to the side, indicating either movement or just a very aggressive posture. He carries an MP5 with a silencer attached, and wears a ribbed turtleneck sweater under his coat. Leon just might be my favourite in the pack, although it’s a close race with the next guy in line. Model #5 – Ian McIntyre has the appearance of an elegant gentleman, with a suit and an executive haircut. Combine this with a sniper rifle, and you have a classic modern day assassin. Ian’s competing with Leon for the title of nicest model in pack. Like all Street Violence packs, Hired Hitmen costs €17.15, which amounts to a little under €3.50 per model. It’s not that bad a price for quality wares, but since in this case the quality was dubious, I’d have been pretty disappointed had I not happened to buy these for the measly price of €6.50 for the whole pack. Overall verdict: These people appear to be solid professionals. Their business-like attire attests to this, as well as their fairly heavy and sophisticated weaponry. While I use them as Underworldish vampires, there’s a ton of other uses for them as well. As the name suggests, they’re excellent as hitmen, but could serve as organised crime or corporate operatives just as easily. However, if you have a chance to pick these up in person, do so and check the casting quality to spare you from the chore of crunching through tons of mouldlining. As I’ve mentioned before, Foundry has some pretty terrible fixed p&p rates, so you’ll probably get these cheaper from a retailer. The German MiniaturicuM is a good choice for EU residents. Every now and then you see a miniature that you just have to have. Most miniature enthusiasts know what I’m talking about, and those two that don’t…well, you’ve saved yourself a lot of money. For me this pack was a great example. I found myself returning to the Reaper website time and time again, before my vampire/werewolf project finally justified me buying them. What a happy coincidence! There was a time when vampires were scary. When they were thirsty, they didn’t look angsty and talk about it, but ripped someone’s jugular vein open instead. When they walked out in the sunlight, they glittered for a few seconds maximum before bursting into flames. They were soulless, merciless, somewhat bestial and most of all plain scary. While not all hope is lost – there is still 30 Days of Night, see it now if you haven’t already – vampires are turning more and more into mopey emo kids instead of being at the top of the food chain. I’m happy to say that the Vampire Spawn (03383) pack by Reaper returns to the roots of the vampire. The pack consists of two vampires, one male and one female. They both come on integral bases, which fit nicely on a standard 25mm round base. Some flash and mould lines were present, but they’re nothing exceptional and cleaned up easy. The male is in one of the coolest poses I’ve seen in a while, and he’s the model that originally sold me on this pack. He’s springing through the air arms spread wide and his mouth open, with his hair and shirt flying behind him. From the snarl on his face you can tell that some hapless victim is going to be in a world of hurt in approximately one second. The hands are exaggerated and his long nails resemble claws, giving him a very bestial, demonic look. He is wearing a collared shirt and jeans, with the shirt open, sleeves rolled up and the jeans torn. He wears a necklace with three claws/teeth around his neck and has bandages around his wrists. While the clothing might sound modern, it is actually pretty timeless. You could probably use this vampire in pretty much any time period in the last two hundred years or so. Sure, the jeans have back pockets but it’s going to take only a few minutes to file them off should you want to. There are a few rocks attaching the model to his integral base, but the model still conveys the springing movement well. The female is in a dynamic pose as well, but her stance is somewhat confounding. Is she springing to the side or is she just crouching there with one foot on a rock, or has she just landed there? I have no idea. Fortunately the weirdish pose manages again to convey the feeling of a vicious predator. She looks fast and threatening, and her snarling visage and large hands enhance the look. She wears a corset, a torn skirt and fingerless opera gloves. She also has an anklet and a necklace. Even more than the male, this model can be used in many many different time periods. She’ll fit right in as a modern day goth, a Victorian harlot or a wild west saloon girl. The miniatures are pictured below, and have been painted with black ink to bring out the detail. Larger versions open in a new tab. Both models are sculpted by Derek Schubert and the pack retails for $8.99 at Reaper’s Online Store. I think the price is fine for such quality minis, and the value is even better for us in the Euro zone. Overall verdict: There really aren’t enough scary vampires around in miniature, so Reaper’s offering is a welcome addition. The clothing makes the miniatures suitable for a lot of settings and time periods, which makes them very useful indeed! I can’t really fault anything in these babies, which is probably why I bought them, but if I have to come up with something critical to say, I think that some people might find the rocks on the integral bases inconvenient for rebasing and difficult to remove. Other than that, they’re excellent! My Underworld/Blade/WoD-inspired miniatures project has started off nicely, as I’ve received all of the minis ordered. I thought that since I’m adding a whole bunch of nice new stuff into my collection, I might just as well review them for your viewing pleasure. 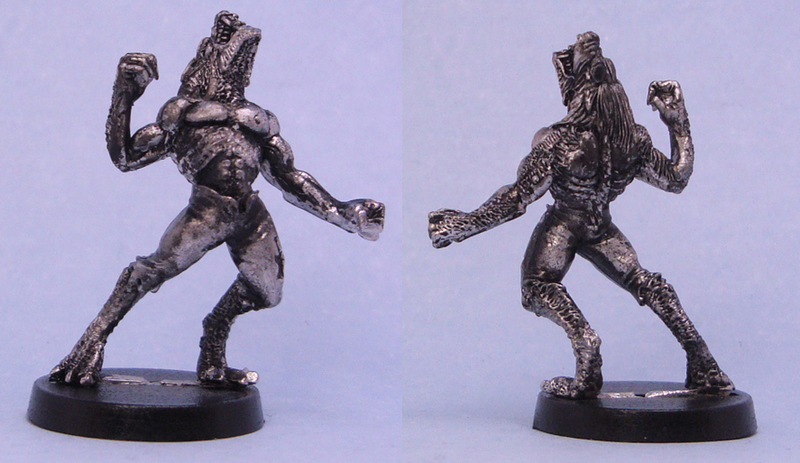 I’ll kick the thing off with two of the biggest miniatures in the project, namely two werewolves from Reaper Miniatures: Jean Paul Werewolf (02747) and Male Were Wolf (02872). Both models are very impressive. The Male Were Wolf (and I use this spelling very reluctantly) is well over 40mm from his base to the top of his head. Jean Paul is under 40mm, but his hunched posture suggests that he too would be over 40mm if standing up straight. As usual, size comparison pictures can be found at the end of this review. They come on integral bases which are too large to fit neatly onto a 25mm round base, so I went for 40mm bases instead, which made for a nice fit. The larger bases are a millimetre or so thicker than 25mm ones, adding slightly to the size of the already sizeable monsters. The werewolves are multi-part kits, requiring some assembly as both have separate arms and tails. The parts fit, but they do require a bit of work with positioning and filing. Noticeable gaps were left after gluing the parts into position, so you might want to break out some greenstuff and fill those. As I’m usually too lazy to do any pinning, the greenstuff helps support the joins as well. Fortunately they’re both furry critters, and you shouldn’t have too much trouble replicating the fur texture in your greenstuff. Some mould lines were present, but they were very minor and I cleaned them up in a minute or so. Jean Paul is in a dynamic posture. He’s a bit hunched and his legs and sense of movement make it apparent that he is springing into action. Jean Paul is snarling viciously, which combined with his long arms and exaggerated large, clawed hands make him very, very imposing despite the model’s comic book style. He doesn’t have fur covering his entire body, and his arms and abdomen as well as the insides of his legs are almost completely hairless. This looks ok for the most part, but there is one exception. His buttocks are bare, but he has a tail sticking out where his tailbone would be. The tail looks a bit tacked-on, like someone just stuck a wolf tail on a human rear. Other than that, there’s nothing to fault here. The model was sculpted by Ben Seins. Male Were Wolf is even better than Jean Paul in my view. He’s covered in fur from head to toe, and he lacks Jean Paul’s comic style. This means he looks very feral, and his whole presence gives off a feel of a slightly crazed, brutal and scary gothic monster. When you’re talking about a werewolf miniature, that’s pretty much the effect you want. The model is posed standing straight with his long, clawed arms spread wide and the pose fits the model nicely. In fact about the only bad thing I can say about this model is the atrocious name. The model was sculpted by James van Schaik. If I didn’t make it clear enough before, these are big werewolves indeed. 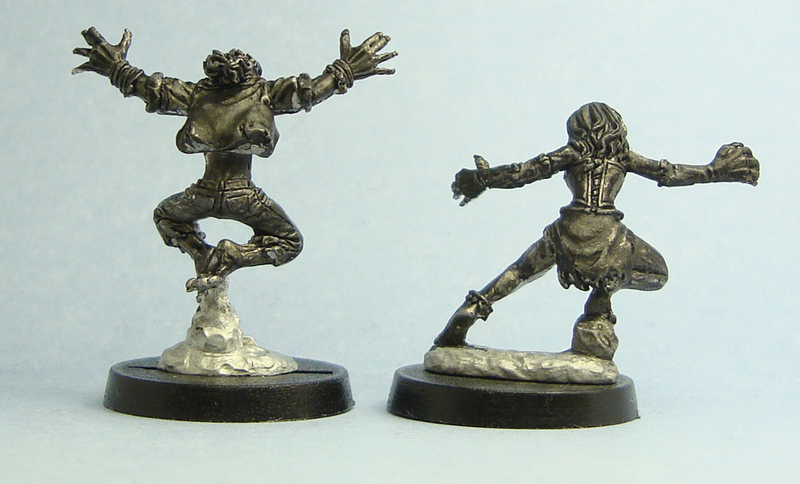 As you can see from the comparison picture below, they dwarf regular 28mm humans in both height and bulk. Good luck bringing those puppies down. Click for a larger picture. Both miniatures retail at $7.99 apiece, which really isn’t a bad price for such hefty pieces of well-sculpted metal. They’re available direct from Reaper Miniatures or through numerous retailers. Overall verdict: If 28mm werewolves are what you’re after, they don’t come much better than this. Both models are wonderful sculpts, capturing the essence of the creature they’re depicting. The separate arms and tails may cause some problems, but it should be nothing too time consuming. Not even Jean Paul’s bare hindquarters can stop me from recommending these. There comes a time in every man’s life, when the zombies of childhood must be left behind. I’ve finally taken that step and am now completely over my foolish zombie infatuation. No, not really. I’ve just recently taken something of a detour to visit another dear old friend of mine, also in the genre of modern horror. Vampires and werewolves, that is. Lately I watched the first two Underworld and Blade movies, which are chock-full of cool, stylized battles between vampires, werewolves and humans. How could I not want to game – or at least collect – something similar? Now, I already have a lot of models suitable for modern horror games which is no wonder considering my love for zombies. The cops, SWAT teams, bikers, military types and such easily fill the role of humans. But what about the vampires and the werewolves? That’s where I’m lacking, at least until the next two weeks at least when I start receiving the €70 worth of minis from various manufacturers that I’ve ordered. To those of you that might be interested, here are my picks. All images are © of their respective companies, used without permission and will be taken down on request. Click on the images to be transported to the manufacturers’ pages. Vampires – I wanted to capture the look and feel of Underworld’s vampires. Stylistically they’re lifted almost 1:1 from White Wolf’s Vampire: the Masquerade game (which even lead to a legal dispute), meaning that they are the embodiments of modern-goth cool. Long coats, leather clothing and black, a lot of it. What makes modern vampires so easy for the collector is that unless you want to give your vampires a feral look, you can simply buy any modern figures you like and just give them a very pale complexion. The image below is a prime example, click for a larger version. Kat by Hasslefree miniatures was a natural choice for me. She has it all, with the tight clothing, pistol and a touch of the archaic brought by the sword. One could almost imagine she was sculpted for such a purpose, but that’s pure speculation of course. Kat is a beautiful sculpt, and one of my all-time favourite models. Cartwheel from Heresy’s scifi range was my next choice. The somewhat crazy firing-while-cartwheeling pose fits the genre perfectly, as do the tall boots, the bald head, the shades and the long coat. Ultimates Hawkeye is a somewhat surprising entry from the currently defunct HeroClix line. While the model isn’t the most detailed, the combination of dynamic pose, modern bow and skintight clothing justify his repainting as a vampire. Update 28.9.2009: HeroClix and HorrorClix are apparently making a comeback under a new company. With the previous three comprising my characters, I still needed some lesser vampires to provide some support. Along comes Foundry, with their Hired Hitmen pack. With their trenchcoats and modern weaponry, they fit the bill just fine. Vampire spawn from Reaper topped off my vampire selection. I bought these in case I needed some more feral vampires, and simply because they’re wonderful sculpts. They’re also useful if I want to play some period vampire games, as their look makes them suitable for several different time periods. Werewolves – I wanted something a bit more unrefined. Compared to vampires, werewolves are often portrayed as strong brutes of the working class, whereas vampires are all about elegance and aristocracy. With this in mind, I went off looking for miniatures that in their human form were fairly everyday, and not uniform in their looks as well as armed lightly compared to the vampires. However, in their wolf forms I wanted them to be big and imposing. See below for the imagery I was after. I had a fairly good idea where to start looking, and as with the vampires, I ended up using miniatures from only a few different manufacturers. Harby, Kendra and Zombie-hunter Kev are all from Hasslefree. Harby will undoubtedly become the leader of my werewolves, being the large, imposing and brutal looking guy that he is. Kendra and Kev are normal looking people with handguns, which is exactly what I was after. The fact that both of the men carry very heavy pistols is an added bonus. There’s nothing like a Desert Eagle shot to the face to keep a vampire down. Security officers Hawque and Dove from Heresy were picked for the same reason as the previous ones. They have mundane clothing and are packing handguns. There’s a variety of different pistols to choose from, with some being more scifi than others. I happened to have Gideon from Foundry’s Doc Friday’s Yardies pack lying around, and decided to add him to the fold as well. The model is absolutely massive, towering head and shoulders above many 28mm miniatures. The large mane of dreadlocks gives something of a wild, hairy appearance which is perfect for a werewolf. The only downside is that he carries a rocket launcher in addition to his assault rifle, and I’m thinking of using some greenstuff to convert the launcher into a duffel bag. Jean Paul Werewolf and Male Were Wolf (consistent, no?) from Reaper were easy picks. 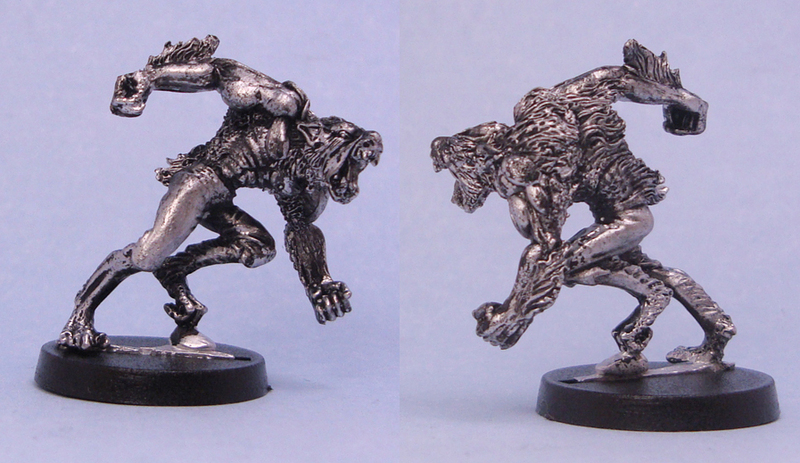 They’re wonderful sculpt of suitably vicious looking werewolves. I like the exaggerated claws and proportions as well. I was happy to find that I could actually pick up the rest of my werewolves (to complete the original group of five that I had in mind) from West Wind. They have a few suitable ranges and a good variety of all sorts of werecreatures. Loup Garou, Wolfgang and Mondheulen all share a vicious look, with Mondheulen looking especially bloodthirsty. And that’s it! Two groups of magical creatures ready to do battle with each other and any humans that happen to get stuck in the middle. After they are finished, I would love to get me a few champion types for both sides. For the vampires, Heresy’s Vampire in Bat Form is a wonderful model, and to fight him, the Warwolf from the nowadays defunct(?) Ilyad games is pretty much the best you can get. At €20 for one model, it should be. The Warwolf can be found by googling, and is still stocked by some retailers. …but I’ll look into these after a year or five, when I’m actually close to completing this project. Luckily it’s not the destination that matters, but the road that leads to it. You are currently browsing the archives for the Vampires/Werewolves category.